The Shared Value Debate. 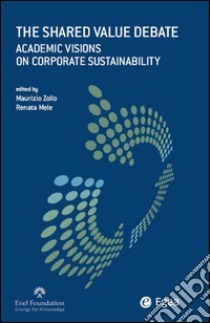 Academic Visions on Corporate Sustainabilityis the first issue of the Enel Foundation series NAcademic VisionsÓ. Sixteen scholars, belonging to universities and research centres located in different countries around the globe, are the authors of short papers that resume their findings and visions on Corporate Social Responsibility (CSR). The volume offers a view on the current academic debate, increasingly focused on the new role that corporate dynamics play in the global scenario, and allows the emergence of the wide variety of perspectives on the core set of issues brought up by the shared value logic. The authors, aware of the growing importance and influence of these issues on future society, deal with key concepts and ideas on the role that Environmental, Social and Governance principles and actions have in shaping the new business model for the incoming years. Reflecting both scientific interests and geographical peculiarities, every article will introduce the readers to a specific issue and peculiar point of view on CSR debate. In the resulting picture, the shared value logic appears as a powerful combination of conceptual wisdom, albeit not all generated by its proponents, and managerial insight, that contributes to diffuse and evolve a new way of conceiving the business enterprise.